We get it. Finding a land-based casino that you like is enough of a challenge. Finding one online that you can trust and figuring out whether the site is safe and legal to play at can be downright confusing. But it doesn’t have to be. You’ve probably got a lot of questions about playing online roulette. Most likely, we've heard them before. We get questions from around the world about everything from bonuses to regulation. Instead of searching the Internet for conflicting answers, we’ve put the top questions and answers right here. Do online casinos offer roulette legally? That depends on where you live. In most jurisdictions around the world, it’s legal to play online roulette. The question of legality pops up quite frequently because it’s often illegal for online casinos to operate out of certain jurisdictions. For example, it might be illegal for an online casino to have its headquarters based in a specific country, but that doesn’t mean that residents of that country are breaking the law if the casino is based outside of its borders. Do countries differ in the legality of playing online roulette? Yes, they do. Gaming law varies from country to country, so it’s always important to check your local law before playing any type of online roulette game. Again, the tax law varies based on where you live. Some countries don’t collect tax on windfalls while other countries do. For example, if you win the lottery in Canada, you get to keep 100% of the prize. A $10 million lottery win equals $10 million in your pocket. But south of the 49th parallel in the US, lottery wins are taxed. The two countries are so close in geography and so similar in a lot of ways, but lottery and casino tax laws are different. Again, make sure you consult your casino tax law before you decided what to do with your online roulette winnings at tax time. The best way to verify whether a site is safe is to choose only sites that have been reviewed and audited by online roulette specialists like us. If you come across an Internet casino that doesn’t appear on our site, you could put your financial info and personal details at risk. If you still feel the need to play, make sure that they’re licensed by an international gambling authority and that they take the necessary security steps to keep you safe. Many of the top casinos are audited to ensure their software meets international gaming standards, that their random number generator is fair, and that their payout rates are fair for players. Sites like this one also audit online roulette casinos from a player perspective, examining deposit process, withdrawal times, game selection, software quality, customer service, and more. How many games do online casinos offer? That depends on the site, but a typical online casino will offer anywhere from 100 to 250 online casino games. Not only will you find online roulette, but you’ll also find all your favorite casino games like blackjack, craps, video poker, baccarat, slots, and more. What roulette variations will I find? Most of the large online casinos offer multiple varieties of roulette. You’ll find American Roulette, French Roulette, and European Roulette at all the popular online casinos. Some casinos even offer specialty versions of the three variations. Regardless what you try, we have provide some top tips to make the right decisions when picking your game. Will I get a welcome bonus for playing roulette? Yes, most online casino bonuses apply to online roulette players. Bonuses give you more ammo to work with at the tables by matching your deposit with extra cash. Some online casino bonuses exclude certain games so make sure roulette is part of the bonus you choose before you commit to it. Can I play roulette online on my mobile? At some sites, yes. Online roulette is probably one of the hardest table games for software providers to get right on a mobile device. Smartphones tend to be pretty small, so cramming a wheel and a 38-number roulette board with side bets onto a 4-inch screen isn’t exactly a piece of cake. However, many mobile casinos have managed to make the best use of the small screen real estate, so if you really want to play on your smartphone, there are options. Not necessarily. Many of the top online roulette Internet casinos offer two types of software - a downloadable version and an Instant Play option. The downloadable version puts an app directly on your PC, so you can access your favorite casino games with just a few clicks. With the Instant Play version, you get access to the online casino through your web browser. There’s nothing to download for the Instant Play option, but you need to make sure your browser has the flash plugin installed. What options are there to make a deposit at an online casino? That depends on where you live. For most countries, you have the option to make a deposit using Visa, MasterCard, prepaid credit cards, and bank transfers. Depending on where you live, you might also have other options available to you, like UseMyBank, Neteller, Click2Pay, Skrill, and more. Again, withdrawal options depend on where you call home, but for the most part they tend to be a little more limited than your deposit options. Most countries offer withdrawal by check and bank wire. If a third party funding option is available, you’ll likely be able to deposit and withdraw your winnings through that option. How can I withdraw my welcome bonus? Welcome bonuses usually require players to wager a certain amount before they can get their hands on their winnings. Casinos set individual rollover requirements for deposits, which dictate how much money a player has to wager in order to release their bonus money into their real money account. Once the cash is in your real money account, you’re usually free to withdraw it. Of course, you should consult the bonus rules before attempting to withdraw your money. No, that’s the great thing about online roulette casinos. They want you to experience their software and fall in love with it, so they offer free games on the house. Just remember that the money you win by playing at the pretend online roulette games can’t actually be withdrawn. That depends on where you play and what type of deposit and withdrawal method you use. Many online casinos will cover the fees for deposit and offer free withdrawals when you use certain methods like credit cards and bank transfers. Third party transfer services, however, often come with a fee that the casino has no control over. 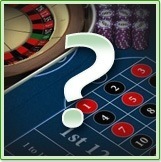 Most reputable casinos will list their deposit and withdrawal fee structure on their website. If you don’t see it, feel free to contact them. Are the games really random? This is a great question that a lot of new casino players ask. When you choose to play Internet casino games, you don’t really know what goes on behind the scenes. That’s especially true with roulette. When you play live, you can see the wheel spinning. In land-based casinos, it’s all about physics. But online, you need to trust the randomness of a computer. Thankfully, the top online roulette casinos employ a random number generator that randomly determines the outcome of a game irrespective of what the bets are. Random number generators are tested for randomness by major tech firms so you can be confident when choosing an online casino.